Rymlig 4 sovrum, 4 badrum villa sova 8 + i luftkonditionerade rum. Utanför är stor täckt hårda middagar däck. Det finns en stor pool ligger i härliga tropiska trädgårdar. INSIDE är ljus och luftig, en mycket stor matsal / vardagsrum, teak bord och bekväm soffa och stolar. Den är inredd under i en blandning av lövträ, sjögräs och moderna tyger. Det finns ett stort kök, ytterligare matbord, stor hall och TV-rum. ENTERTAINMENT: Detta är vår semester hemma så det är perfekt för familjer med barn. Det finns en stor HDTV, satellit-och DVD-spelare, en leksak låda med ett bra urval av barn spel och leksaker, massor av böcker och DVD samt en gunga och repstege i trädgården och cyklar för åldrar upp till C9. Baby & TODDLER utrustning läskigheter inklusive barnvagnar, bilsäten, barnsäng, babysäng, barnstol, baby bad, potta och plast plattor / bestick. Du behöver inte ta allt på planet. Badrummen har alla moderna kaklade duschar. Babybad tillgänglig. Like most Photos they never do somewhere justice and that applies to Mullins House it's absolutely beautiful,the house itself has a rustic charm everything you will need and more,but the main area is outside,the Veranda to sit on and enjoy meal times, the wonderful garden with its pool are exceptional,a marvellous place to relax,if like us you have children with you they will absolutely love it,so much space for them,with the daily bonus of green monkeys visiting most days.The House is well placed for the west coast, in our opinion give the nearest beach Mullins a miss better beaches just down th Road Gibbs&thunder bay both excellent.Andrew and Oneta who look after the house are very helpful answering any questions you ask,Andrew also cooks a mean mac and cheese pie, the best we've had. This has been our third time on this wonderful island and now know our way about,but for anybody who hasn't been Sarah and Simon's Information pack you get while at home is invaluable,its second to none,the home drawn road maps with places to visit with all restaurants,shops,beaches supermarkets ,fish markets would make your stay so much easier,unlike the first time we came . Thank you for your great feedback and we are so glad you enjoyed your stay. We will look forward to welcoming you back again another time. A true gem - don’t stay anywhere else ! Set within a quiet residential area but only a few minutes walk to beach . Main coast road has buses that run constantly up and down the West coast so exploring is easy . House combines an easy ,authentic ,family style with excellent facilities including efficient air conditioning in all bedrooms. Spotlessly clean. House staff are unobtrusive and attentive and the owners a delight to deal with .Sarah and Simon will provide numerous excellent suggestions if asked - this is their much loved second home and this is very apparent when you stay. Flexibility to holiday with others is a bonus due to the additional garden and pool apartments. Multiple local restaurants - either walking distance or a couple of stops on the bus away . Sunsets are amazing on this west coast - even better when accompanied by a rum sour on one of the west facing beach bars .Would highly recommend the property . Great property, well equipped with beautiful gardens and a great deck and pool plus close to the beach. Great location on the West Coast. Fantastic service from the owners. Wonderful experience loved by our group of 8 staff was very helpful with our request. My family and I just arrived back from an amazing week in Barbados. Mullins Bay House is a perfect location and welcoming property offering spacious living quarters and a beautiful covered deck. The grounds are lovely and calming as well, where we were treated to numerous visits by the local monkey family. It was great to be steps away from beautiful beaches, restaurants and bars, yet able to retreat to this private property. Sarah and Simon offered wonderful tips and were gracious hosts. I highly recommend a vacation at Mullins Bay. I hope to return soon! Loved the location, close to public transportation and a couple of beaches. 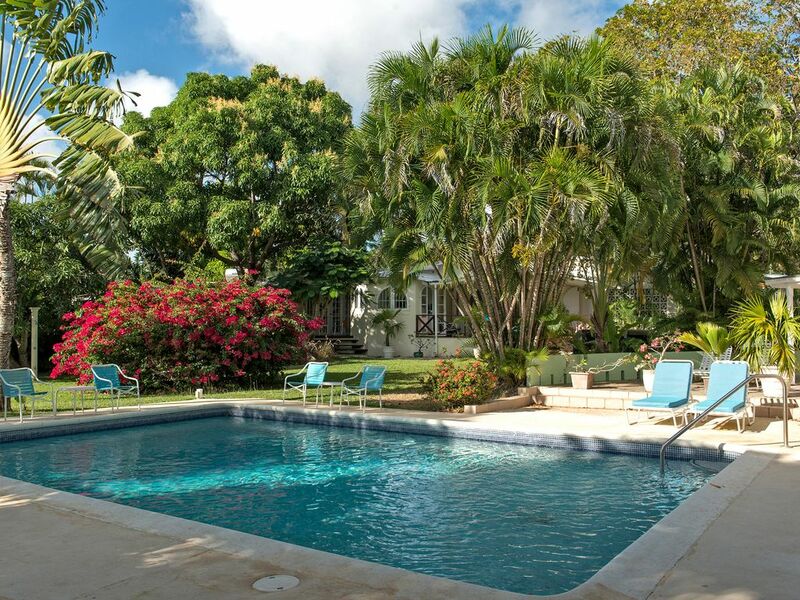 Rental rates are for up to 8 people sleeping at Mullins Bay House and include maid service. Additional adults are £100 per week, children £50pw. Arrive and depart on whatever days suit you - we have no fixed changeover day. All linen and bathroom towels included. Please bring your own beach towels. Late availability offers may be available if you are booking at short notice.